Despite a background of violence and poverty, author Linda Hayes climbed her way to success. A respected business director with a family she cherished, she appeared to have it all. But deep within, Hayes felt undeserving and fearful. 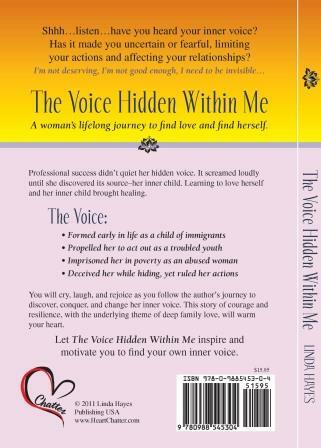 The Voice Hidden Within Me chronicles her voyage to discover the roots of these false beliefs and ultimately transform her life. Readers will see you have the potential for limitless power to overcome adversity. Cherish your family, remain positive, and believe that all things are possible then they will be. If you have lost your faith or forgotten your purpose in life it will surely be strengthened through the poignant experiences and insight gleaned from this book.